Helpful for what? Good question! A recently published article showed that feeding 70 grams (a little more than 2 ounces of broccoli sprouts daily for two months to 48 people with a documented infection of Helicobacter pylori (the bacterium known to cause stomach ulcers that may ultimately lead to stomach cancer) significantly reduced several bio-markers of both infection and inflammation. For comparison purposes, a control group was fed the same amount of alfalfa sprouts for the same time period with no beneficial changes seen. This study is the first that has been done in humans documenting this beneficial effect, which is important in and of itself. However, the really important point is that the values showing the reduced inflammation and reduced infection returned to their original levels two months after the intake of the broccoli sprouts was stopped. Now I would venture a guess that consuming 70 grams of broccoli sprouts daily is going to be boring if not difficult, and that statement is coming from a "fan" of all things Brassica! What this study does not determine is the minimum consumption of broccoli sprouts needed to produce this benefical effect in a daily diet or even as a weekly intake, nor does it demonstrate that other brassica foods containing a level of the presumed active compound(s) would not also be effective. However, as I mentioned, the study clearly showed that daily consumption was beneficial, was not harmful, and that stopping consumption permitted a return to potentially harmful levels of molecules indicating both chronic infection and inflammation. 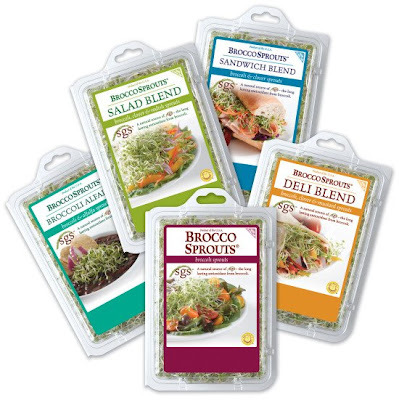 Broccoli sprouts are commonly available in most grocery stores, available from a couple of different sources. I am not "promoting" the purchasing of any one brand (i.e., I have no financial connection to any company that creates this product for purchase). In fact, there is information on one website that tells where to purchase the same seeds that company uses (same as those used in this research study), which I may do for home sprouting. In the meantime, I will say that I purchase broccoli sprouts regularly and use them on salads and in place of lettuce in a sandwich or wrap. My bottom line: That should be easy to guess! Strive for daily consumption, i.e., 365 days per year, of kale (or other Brassica vegetable, including broccoli sprouts) to obtain a daily intake of delicious, cancer-fighting and overall health-promoting foods. Thanks for sharing this study. I've never tried sprouting broccoli. In fact, my sprouting jars have been empty for too long. I think it's time to put them into use again even them my focus is turning to the outdoor garden. I'm going to look for these sprouts at Whole Foods (most likely store near me to carry them).